Microsoft announced that incorporates share button "Pin It" to Pinterest from the search results of images in its search engine Bing. Microsoft is clearly trying to make its search engine Bing as "social" as possible. From 2011, he joined the Facebook programming interfaces and the ability to filter search results with the results of their Twitter contacts. 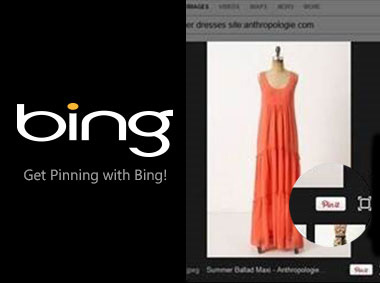 Now, Bing continues to rise with the social integration of a button "Pin It" shared to the network Pinterest. The Redmond giant has not released this feature by accident and says he drew his conclusions after gathering a group of bloggers in their HQ last fall to discuss trends and needs. "They shared with us some of the problems they face, such as the ability to trace the origin of an image, but also pictures in high resolutions and filters better designed," says Microsoft. The integration of a button to Pinterest is one of the answers to improve the lives of users of Bing. Unfortunately, only the U.S. version of Bing advantage at the moment, but the function should happen fairly quickly in the other countries.